“Growing the Game.” A fine slogan and more players are needed to keep golf healthy as both a sport and a business but at times even the best slogan can get in the way of what really should be done. It was natural for Calum McPherson, formerly a scratch handicap himself, to want his own children to play and be able to find the same passion and rewards as he had in golf. However McPherson soon found the clubs available for young beginners had a huge problem. Because they were too heavy children lost their balance especially on the downswing so learning rather than fun became a struggle and frustrating. Put another way, would you keep playing much less spending time hitting balls on the range if you fell down or almost fell down every swing? Of course not. You would either find another way to swing or another sport. Not only were the current clubs for beginners ages 3 to 12 too heavy but teaching them the proper way to swing was out of the question due to the lack of balance. What was needed were clubs weighting less that children could swing, be in control, get results and have fun. Enter McPherson and his Scottish brand of entrepreneurship two years ago. Experiments were set up with Strathclyde University to analyze the relationship of the weight of children’s clubs to the biomechanics of the swing and the results gave McPherson what the best club weight should be in relation to the strength of the children. McPherson designed ultra-lightweight prototypes and kid-testing showed 94 percent of the testers benefited compared to the usual junior clubs so Golphin for kids was born. G olphin clubs have several important concepts built into them. Clubheads are larger than the usual juniors’ so making contact is less of an issue and the heads have an immense sweet spot with most of the head weight in the sole. Combined with larger than normal grooves and a flexible shaft a young beginner can get the ball in the air and enjoy some success from the start. 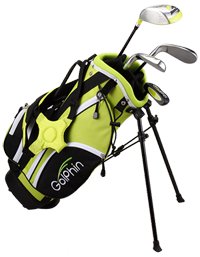 After the initial positive reception in the UK and Europe Golphin has come to this country and reception at January’s PGA Merchandise Show was enthusiastic. 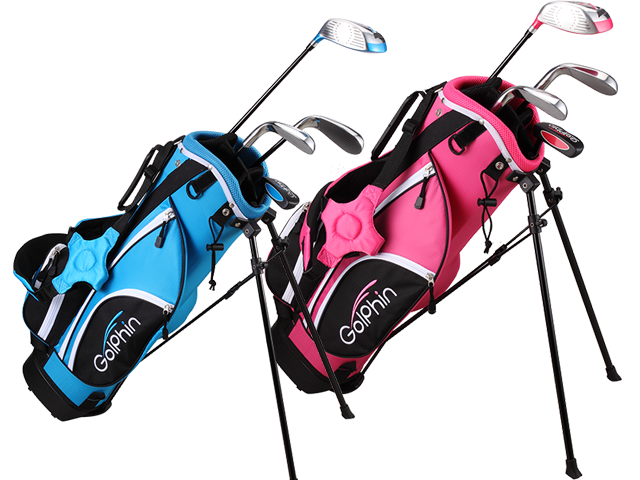 Four different size sets are offered on Golphin.com with clubs 22 percent less weight than comparable junior models and a sweet spot that’s 35 percent larger. For 39 to 43 inch high swingers there’s a kid-sized stand bag with 16 degree driver, 34 degree 7-iron, a “swedger” of 62 degrees and putter priced at $150. Other size sets for players 43 to 47 inches ($160), 47 to 51 ($170) and 51 to 55 inches tall ($180) complete the lineup.